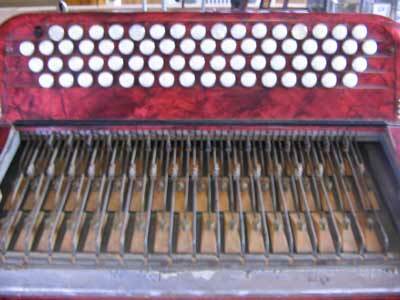 The accordion is a free reeds instrument. The sound is produced by a reed fixed at one of its ends, in contrast, for example, to the musical saw, which is held by both ends : on one side by the knees or feet, and the other by hand. The reed can be made in various materials as required. It is usually made of hardened steel to get the best sound quality, but for use exposed to the weather, manufacturers offer stainless steel reeds, less powerful and less stable at the tuning, but that avoid the rust that develops on all instruments due to the passage of air, but which is particularly problematic in tropical countries, near the sea or on instruments such as harmonica, where the air is brought directly by mouth. The reed is riveted, so in one end to an aluminum base, dural, zinc or bronze for older high quality manufacturing. This base is itself fixed either by nails or with a special wax according to the quality of the instrument, to a wooden reed block in order to transmit and amplify reed's vibration. 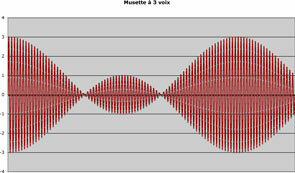 This results in a kind of big harmonica as a basis for the formation of sound. Indeed, the harmonica works exactly on the same principle as the accordion, with stainless steel reeds to prevent rust due to moisture of breath. 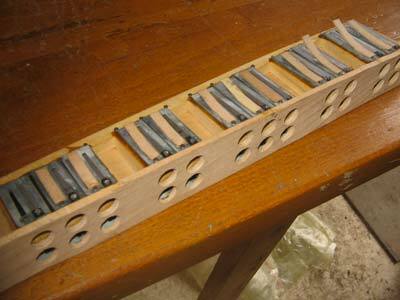 The reed block is attached to a soundboard which, according to its design, will affect the sound. A resonance box instrument, for example, cut the most acute harmonics for a warmer and rounder sound. 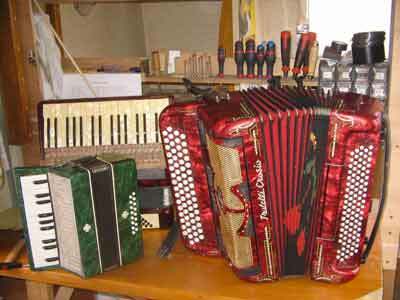 The sound you hear in the end is then slightly transformed by the passage through the accordion that, according to the openings that are performed and the materials used, will be a little muted and will transmit more or less sound in our ear. It will be understood, accordion is as a harmonica where the reeds' oscillation is not performed by the mouth but by the bellows. Accordion repairer will be able to work on all instruments called "free reed" which are: harmonicas, concertinas, bandoneons, melodicas and accordinas, harmoniums, etc ... For more information on the functionning of your instrument, you can refer to the works of Thierry Benetoux, renowned tuner installed near Avignon (Comprendre et réparer son accordéon and L'accordéon et sa diversité sonore). Mechanisms which make the connection between the button pressed and the note played are very complex and a novice who takes for the first time a look into his instrument is quickly terrified ... Indeed, various mechanical transmissions allow, for example on bass side, to create an association of 3 or 4 notes from the press of a single button. The adjustments of this mechanical can only be carried out by a professional who will know immediately where to act to improve the performance of such mechanical. We have all of us very specific tools to make very precise adjustments. The concert instruments (chromatic bass) have a second switchable mechanical, which allows you to switch to standard bass, a little further complicating the problem. The sealing also requires other skills, whether in identification of the leak, valves adjustment or the work of skin. Just the bellows, fundamental piece, includes a dozen different materials and requires a great deal of expertise to respond well depending on the cause of the failure and the state of the instrument. In addition, a high-end instrument will include even more mechanical parts and openings that will create much more difficulties to get a quality instrument. 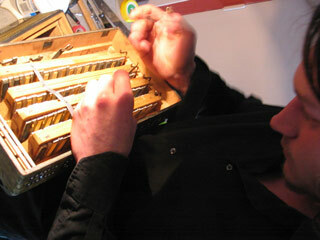 The renovation of reeds is often the biggest part of the work if the instrument has not suffered harsh treatment. If it has not been revised for over 3 to 4 years or has been exposed to the elements, it is very probable that rust starts to install, requiring cleaning each reed one by one, after getting them all deposited. 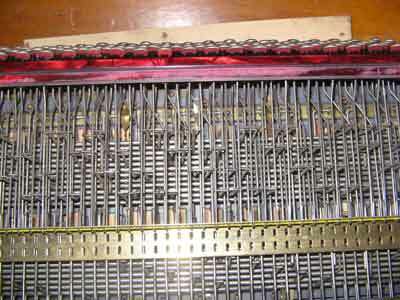 Each button is actually related to two reeds: one when pushing the bellows and one when pulling. 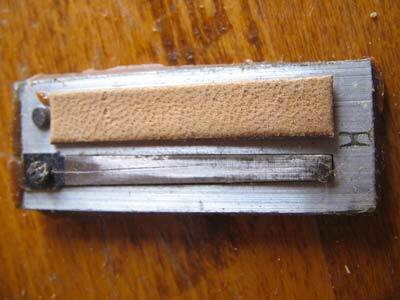 To avoid interference and air leaks, a skin flap is located behind each reed (see previous photo of a reed). 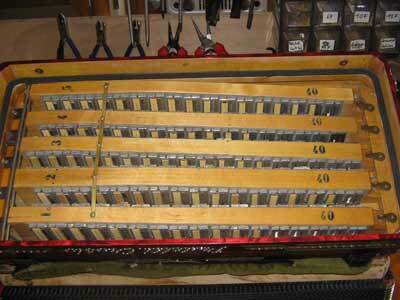 Over time, these skins are relaxed (as seen in the photo of a reed block, which needs a total renovation!) and it is necessary to pick them by giving the nerve expertly, making the compromise between hard skin which will prevent the reed from easily ring and soft skin that will relax quickly. On a very old instrument, we will have to change most of the skins, too old. On low-end instruments, today are used synthetic skin that resist longer but can not be re-tensioned, requiring replacement at first signs of weakness. The reeds are then resolved one by one for their start on the first stream of air, and to perfect the homogeneity of the instrument. Anti-rust treatment can be applied to delay the onset of this disease. This list is of course far from being exhaustive, the instruments that come to us have different problems depending on their past and it is impossible to make a repair estimate without being able to see and hear an instrument. The said "clean flute", basic sound of your instrument. The Bassoon, voice tuned to the octave of flute in the bass. The Piccolo, voice tuned to the octave of flute in the treble. High and low flutes, slightly detuned from the clean flute. The Flute, Bassoon or Piccolo, using only the same named voice. Bandonion, using the flute and bassoon. As the name suggests, this is the only registry of bandonions. Double bass, using two bassoons in resonnance box, giving very particular sound widely used in jazz. 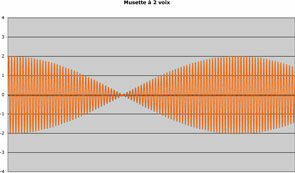 Brio or "musette", using two or three flutes, the utility of which is explained just below. Full play, using two flutes and bassoon. Clean tune : the two flutes are exactly the same, giving more volume and a nice boost to the note. Mostly used in classical music. Swing tune : with few beats, it is much used in jazz. American tune : precursor of swing (used for example by Gus Viseur) is a good compromise used as factory reference if nothing is specified by the customer. Celestial tune : with a lot of beats, perfect for dancing and traditionnal music. 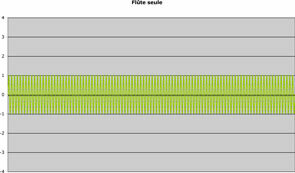 "Musette" tune, called "the real musette": same as celestial but using more the low flute opposite of high flute, increasing the amplitude and frequency of the beats (see charts below). All these tunings can be made in our workshop, no one being better than another. It only depends on your repertoire, your tastes,... of you... If you wish, it is also possible to use intermediate tunings, the most common being the attenuated american and increased american.